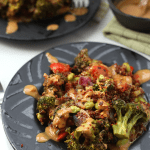 A quick and easy one-pan meal, this Thai Quinoa Casserole makes a flavorful vegetarian dinner recipe for the whole family. 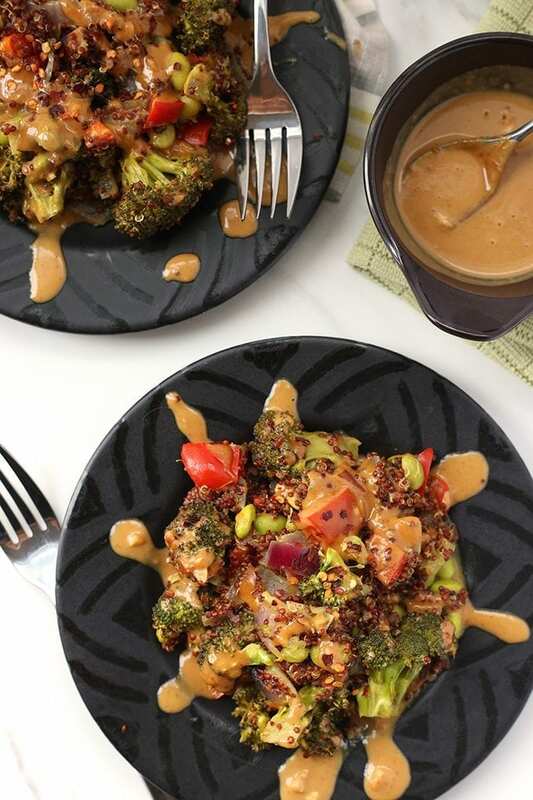 Topped with a zesty peanut sauce, your weekday dinners are officially complete! Costco encompasses all that I hate and love in this world. As someone who *tries* to be a conscious consumer, it’s pretty much the worst place on earth for me to do my shopping. On the other hand, I’m a sucker for a good deal and $16 for a GIGANTIC bag of organic quinoa is hard for me to turn down. I literally have a moral dilemma every time I walk through the doors at Costco. First, I should preface this statement by sharing that my Costco experiences are not the average. If any of you have ever experienced Costco with my mother, you know what I mean. There is no going in with a list of things you need. You must absolutely walk through every single aisle, inspecting every single item in the store. Then she proceeds to call each of her 4 children and ask what they could possibly need from Costco. Unless of course you have the privilege of accompanying her on a visit. In addition to a love-hate relationship with Costco, I also have a tumultuous relationship with documentaries. I am the ultimate documentary watcher. If you ever want me to join your crusade, just get your doc up on Netflix and place me in front of it. I will be on board 5 minutes in. After watching Cowspiracy, I basically became vegan. After Blackfish, I boycoted Sea World (not that I’ve actually ever been…) and after True Cost, I became exceptionally conscious of my purchasing habits. I can no longer walk into Costco without a care in the world! All I see when I stare at those cheap lululemon knock-off pants is a sweatshop. And when I spot those gigantic bags of Skinny Pop I am forced to relive my lack of self-control.. But I also realize that it’s not an effective or enjoyable way to live by being scared of everything. I already spend enough time on WebMD diagnosing my various ailments that spending all my spare time researching fair-trade, locally-sourced, sustainable everything would leave me with little time to actually live my life. So as with everything in my life, I’m coming to terms with the idea that I can’t live life “perfectly”. I can support my local farmers and buy my cheap organic bag of quinoa from Costco. I can buy a scarf at Zara and a sweatshirt from a local designer. I can play my role in sustainable living by decreasing my meat consumption but still having the very occasional piece of bacon. Add all ingredients together in a large bowl. Spray a large casserole dish (9×13) with coconut oil spray. 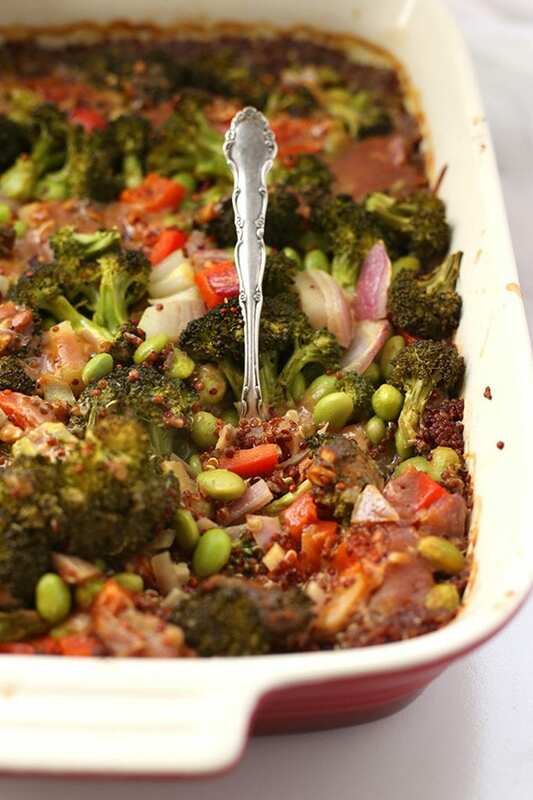 Add uncooked quinoa to casserole dish and top with red onion, broccoli, edamame and bell pepper. Combine water and coconut milk and stir in curry powder, ginger, cayenne and salt. Pour water-coconut milk mixture over quinoa-vegetable mixture until well coated. Top with half of peanut sauce and cover with tin foil. 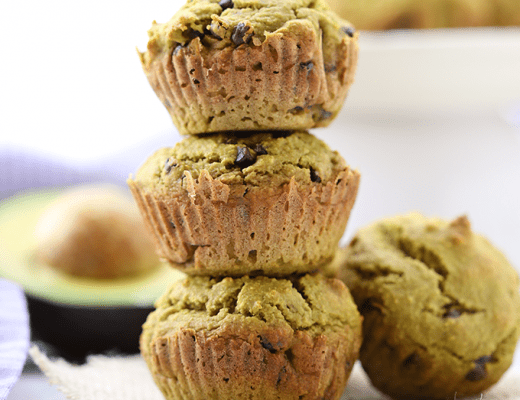 Remove tin foil and bake for an addition 10-15 minutes or until all liquid has been absorbed by quinoa. Top with remaining peanut sauce and serve. 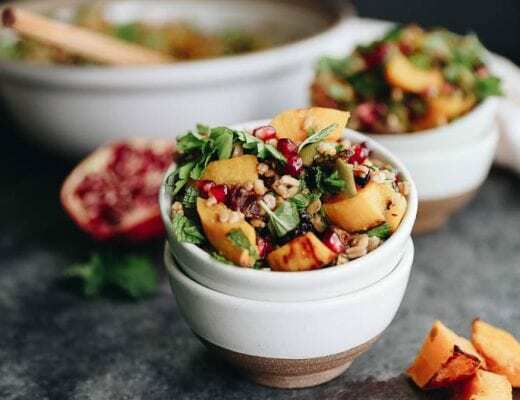 *I used red quinoa but if using white quinoa you will need to adjust baking time to 45 mins covered and 5-10 minutes uncovered. Thoughts on Costco? Are you as easily swayed by documentaries? Costco is the only place I buy quinoa anymore! We bought 4 pounds last weekend. i love how many organic options for food there are there! Like, slightly obsessed. This looks DELICIOUS! I love the peanut sauce. 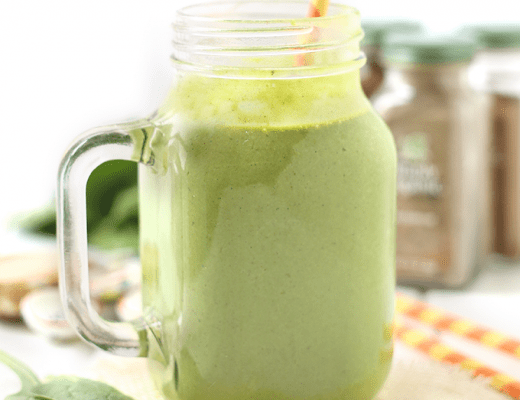 I’m missing a few ingredients but I’ve added them to my grocery list so I can make this next week. Thank you! Perfect! Hope you enjoy, lovely! My daughter shops at BJs only because of the great selection of organic vegetables. This recipe looks yummy. What can we use to substitute peanut butter? Tahini? Or would it be possible to try almond butter instead of peanut butter? Almond butter or tahini would be a great substitute! i try to be conscious consumer but due to my lifestyle and finances, it is very hard to be perfect all the time..but small efforts counts too i hope in the long run. i do get influenced by documentaries a lot as well. Exactly! Just gotta do the best we can, right?! Ugh, Costco is the best and the worst. They do have some good deals on healthy stuff, which I love, but somehow my boyfriend and I usually end up there on a Sunday with the rest of the world and everyone just loses their common sense. I just don’t get it. We just got that huge bag of quinoa last week from there, so I think I will try this next week! It looks bomb! As you know I LOVE Costco and when you live on island 30 miles out to sea stocking up at Costco is a huge money saver for me and YES it is the only place I buy quinoa now. It’s 100% worth it. I can totally get where you’re coming from! This looks so tasty! Adding this to my list to try this month 🙂 Also seems like a great ‘batch cook’ type recipe to get meals made for the week. This looks super delicious Davida! It’s lunch time and this officially made me hungry! Thanks for sharing all of your deliciousness!! GIRLFRIEND I brought a bag of fair-trade, organic, solar-roasted coffee with me to Malibu LOL…Lee and I polished it off in an amount of time I’m too ashamed to admit…so we succumbed to a bag of Peets from Target haha. Can’t always win! 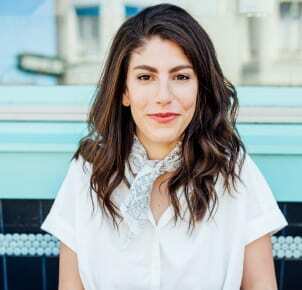 Quinoa with an Asian fusion? How delicious does that sound?! I also watched Cowspiracy and I’ve decided to make a very slow transition to a plant based diet. I haven’t started just yet–I’m going to be vegetarian by the time I start college and I can’t wait! I LOVE COSTCO. Not as much as Joe though. He goes and buys me boxes of Kind bars and ships them to me 🙂 I actually just get Costco delivered here… because #sanfrancisco. I just made this for dinner and it was DELISH! Definitely going to be added to my regular recipe rotation. That peanut sauce is amazing. Thanks for a great recipe! I’m curious, what’s your morale dilemma with Costco? It wasn’t clear if you were upset because they’re a big box store or because they sell meat. I only ask because I’ve never heard any criticism about Costco before. They’re a big employer where I live in Seattle, because they’re headquartered here. They provide living-wage jobs to even those on the bottom of the corporate ladder. In the 90s, I worked for a local grocery store and was paid $4.50/hour. I had friends who bagged groceries at Costco and the starting wage was $10/hour. This was 1992. I don’t know the start salary now, but I bet it’s pretty high. I just think they’re a great company all around and they have an amazing wine selection. That’s saying a lot coming from me, because I’m generally anti-big box in general. Luckily, we don’t have Walmart in Seattle, so I don’t have to ever even consider shopping there. Not trying to start an argument, I’m just generally curious. BTW, I’m going to try your recipe this week. If I wanted to add chicken, do you think I could put it in with everything in the casserole dish? Or just cook it separately and add it after? Thanks! Looks delicious. When you say to pour the milk mixture to cover, do you mean to not use the full amount? Also should the vegetables not be stirred? I used the full amount and stirred it and followed the recipe to a t. It has now been cooking for 50 minutes covered and 30 minutes uncovered and the quinoa is still not cooked. Gonna try covering it for a bit to see if it can be salvaged. Hi Krystle. Yes, the full amount should be used. What kind of quinoa are you using? Also perhaps your oven runs cooler? I’ve made this many times, as have so many others without any issue! Hope it works out for you. I had EXACTLY the same issue when I tried this. It took about twice as long as indicated to get to anything other than soup. I used white quinoa, and started with a hotter oven (my husband had just cooked a pizza at a higher temp). I did use a round casserole dish instead of the 13 x 9, I used the full amount of liquid, and I did stir everything together. The flavor is great, and I’ll certainly try it again, but by the time the casserole wasn’t soupy anymore, everything got a little goopy instead. I suspect the wider dish (thinner layer of quinoa,) plus the layer of vegetables (rather than mixed in) might have made a difference in the steaming/cooking time. 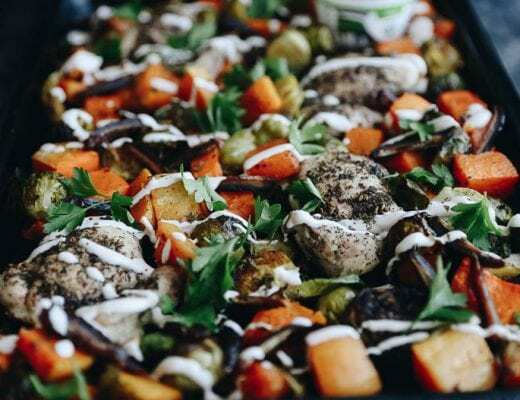 I just came across your blog and I have been going through the Man-Friendly Vegan Meal post which I have to say has some very delicious and creative recipes. I can’t wait to make some of these recipes and share them on ig. 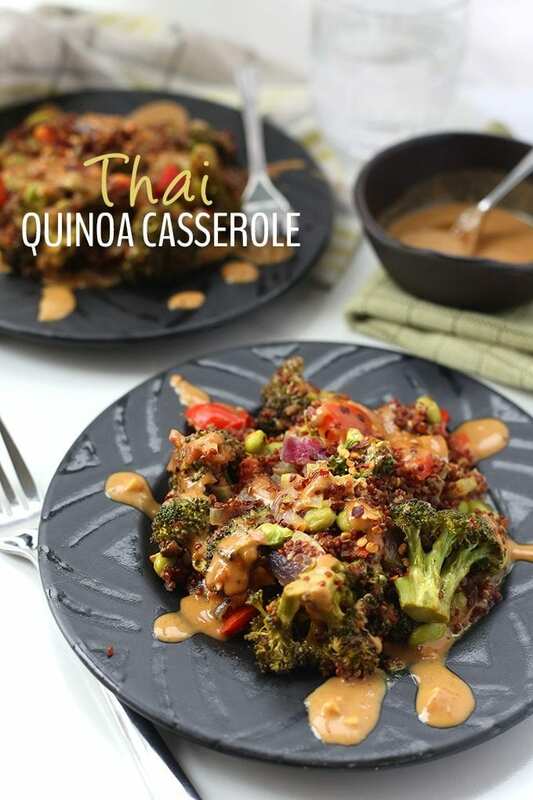 I just wanted to let you know that you should add a note for a substitute to honey in your Thai Quinoa Casserole dish to make it completely vegan for those very strict vegans. yup! You’re so right – maple syrup is a great substitute as is coconut sugar. Thanks for the heads up! This was so good. My husband hates qunioa but he loved this dish. The full fat coconut milk made it so creamy and delicious and I’m so glad it makes enough for leftovers. Glad you enjoyed! Sorry for being so delayed in responding. Was on vacation. Enjoy the leftovers! Just leave it out or another veggie! This recipe looks delicious! 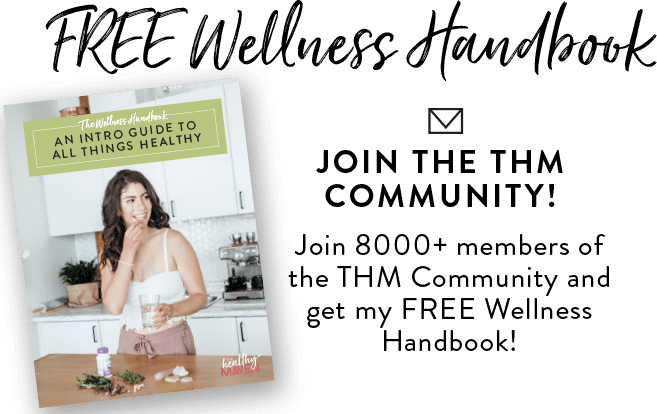 But I’ve never used coconut milk & so I looked it up online – the calories and fat in coconut milk are off the charts high! Any suggestions for something I could use in its place or maybe replace half of it with something else? 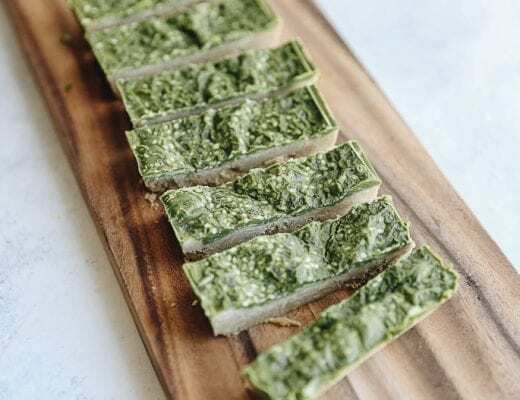 This recipe looks really good…I will have to try it! Oh, and FYI, unlike Lululemon, those “cheap knock-off yoga pants” are actually made in Canada, and are actually a decent quality, like lulu was before they sold out and began making them in sweatshops in China. Wouldn’t hurt to do a little extra research if you are wanting to be a more conscious consumer😃 Not to mention that a huge bag of organic quinoa at Costco is a fraction of the price at the supermarket, so one again, smart consumerism! Looks to me like they’re made in Lesotho and Vietnam. And lucky you that you can get a bag of quinoa that large at the grocery store. Not an option here. Thanks for the additional research! You must be in the USA? The yoga pants in Canada are made in Canada! And it looks like autocorrect got the best of me…I meant to say the big bag at Costco is a fraction of the price of the small supermarket bags…much cheaper to buy these things at Costco! wonderful! Happy to hear it. Is the coconut milk 1 1/4 cups or 1/4 cup? The font is difficult to decipher. I just made this, it was good and my dad really liked it! But I would say the amount is 3 main meal servings. I just used half of the can of coconut milk (and rest water), but for me it was still a bit too fatty so I will try it with a quarter of a can next time. And I just used 1 Tablespoon of peanut butter…that was plenty..
Great recipe. I don’t mind the coconut milk fat/calories given that this is a meat free dish and the fat is plant based. Haven’t tried it with Light Coconut milk but assuming it would work just fine. I will say, I like a LOT of flavor so I add about 3T of curry powder as well as 1T coriander, 1-2 t cumin, and 1-2t chili powder. I also use fresh grated ginger to sub for the powder. Love it this way but if you’re not accustomed to a lot of ethnic flavor it might not be for you! Making this for the BF and his parents tonight! 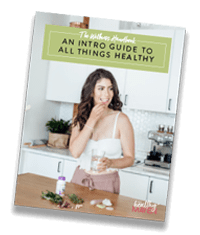 So excited to debut this amazing recipe – thanks for being my go-to for a healthy perspective on food and life in general. Major life goals!! Aw thank you, Emma! This totally made my day. I hope you and the fam enjoy it. Total hit around here! This recipe has become a new favorite of mine, thank you for creating this!! Do you have the nutritional information on this by chance? I made this for dinner tonight and OMG so delicious!!! (and I am a picky eater) This is just perfect. Thanks for sharing your recipe! So happy to hear that! One of my favorites! Referring to the Thai Quinoa Casserole. Not sure where the Sticky Orange Chicken recipe link came from since I don’t eat meat. My girlfriend sent me this recipe and asked me to cook it for dinner. We had most of the ingredients on hand so I gave it a go. It’s so good, addictively good! And it comes together so quickly, it’s definitely going to be one of our go to meals. Only thing I subbed out was peas for the edamame, we didn’t have it on hand. I modified this by cooking rice with the coconut sauce on the stove-top and steaming veggies separately, and putting peanut sauce on everything. (It was too hot to bake). Oh my goodness, Jennifer! Thank you so so much. So happy you both enjoyed! My husband and I are obsessed with this recipe and have it once a week. I make a big ol’ pan for leftovers too. Usually eat it on its own in a big bowl. Sometimes I make sauteed brussels sprouts and throw that in my bowl with it. I put it over diced chicken or tofu, or I just add that to the mixture depending on the day. It’s so easy to tweek. I just throw whatever veggies I have in the fridge. this is amazing. I’ve used rice and also done it on the stovetop and it’s always excellent.